Little did I know how my life would change when we brought the three-month-old bundle of golden fluff into our home. Adopted through Golden Retriever Rescue in Los Angeles, little Nikki was lucky to be alive. Born with a cleft palate and one of only two pups in the litter to survive, she owed her life to a nurse who bottle raised her so she wouldn’t choke on milk. 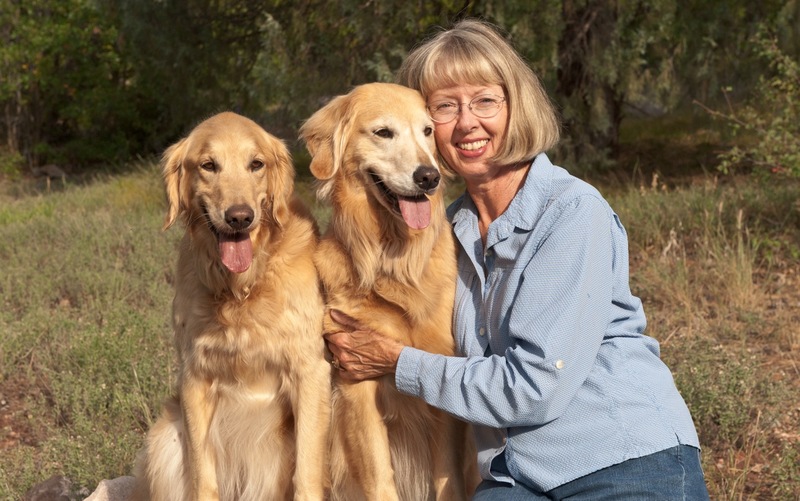 Despite those odds, she grew into a beautiful golden retriever who guided me to a whole new career as a rehab therapist specializing in animal-assisted therapy. 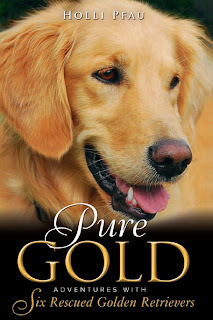 She was the perfect dog, and paved the way for five more goldens who have led me down many new paths. Bodie ambled in as a youngster already rejected by his first owner because he “wasn’t perfect.” Surgery by a skilled veterinary ophthalmologist corrected his “defect” and he, too, became a therapy dog and an avid wilderness hiker. Seeking a younger, livelier companion for still young Tucker, we found Sophie languishing in a breeder’s kennel. Petite, silver blonde and sweet to the core, she had spent her first year with little more than basic necessities. She had never been in the house or in a car or had any training. Once we helped ease her anxieties, taught her new skills, and embraced her in the family, she thrived. Then Daisy arrived on the scene of our placid, comfortable household. Energetic and egocentric, six-month-old Daisy took the world by storm – and us, too. Adopted from our local humane society, she’d already had two homes. We soon learned why: uncontrollable enthusiasm and manic activity. She would require more patience, training and skill than all of the others put together. Today she’s a star agility dog, putting all that energy and athleticism to good use. Last but not least, there’s little Chatter. Rescued from a life of benign neglect and possible abuse, the nine-month-old looked beautiful and whole on the outside, but harbored insecurity and trauma inside. Little by little, she’s been able to overcome the shortcomings of her youth, and now serves others as a gentle, loving therapy dog. This cast of golden characters has enriched and transformed my life. I’d considered writing a book about them since my essay on Sophie, Tucker and Daisy was well received in a class in creative nonfiction. Several years later I attended the Golden Retriever Club of America’s national specialty show in Snohomish, Washington. Daisy and I participated in the Parade of Rescued Dogs. As I gazed on so many beautiful dogs and happy people, I realized that without the work of rescue, many of these dogs wouldn’t be here, or anywhere. They would likely be dead. 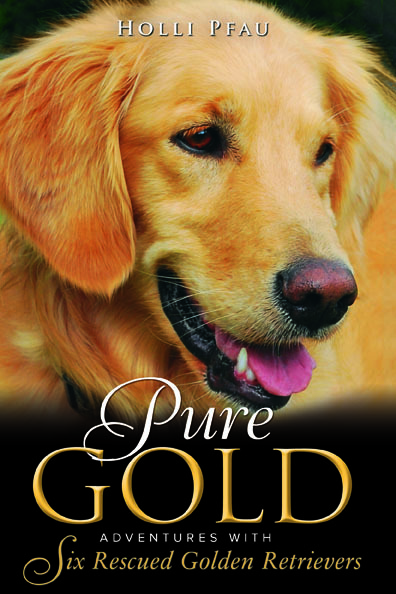 That day I resolved to write Pure Gold and dedicate the profits to shelters, humane societies and rescue groups. It’s the least I can do to honor all the gold in my life. Click here to read the Goodreads synopsis!